May is my favourite month, and I always say that if a garden doesn’t look merry in May, there’s a problem. There should be the last tulips and the first roses, tender foliage and entwining tendrils, sweet birdsong, the heady scent of elderflowers and green, green everywhere. But May spells hard work for gardeners. 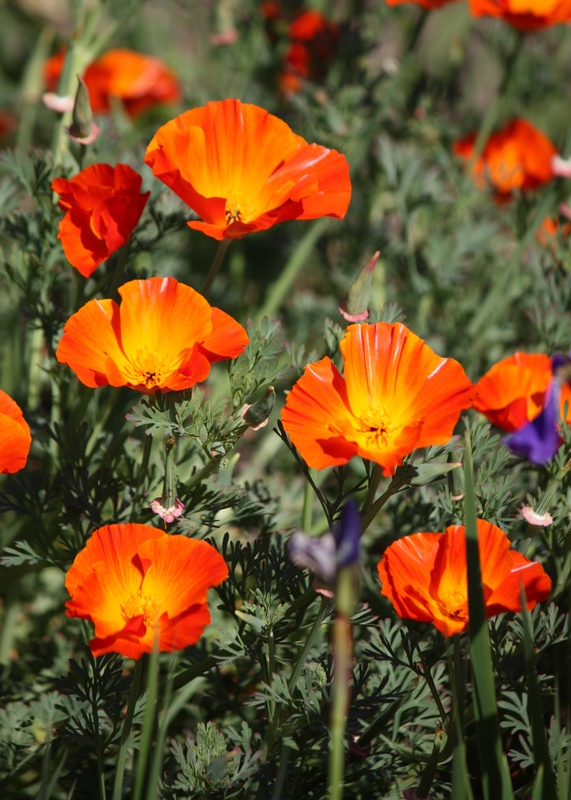 There’s spring bedding to come out, summer bedding to go in, climbers to train, plants to be watered (especially this year), pests taking advantage of every opportunity and everything growing before one’s eyes. When I took this week off, I was determined that Chelsea would not take over, as it usually does. It was a good Chelsea Flower Show, but not a vintage one. The nurserymen in the Great Pavilion excelled, but the gardens were average by Chelsea standards. That’s not to say they were not accomplished, but I don’t think I’ll remember a single one of them come this time next year. One of the most lovely was Kazuyuki Ishihara’s Gosho No Niwa : No Wall, No War which is a garden I could have uplifted in its entirety and enjoyed forever. The Japanese designer never strays far outside his comfort zone, but does what he does with astonishing craftsmanship and precision. Wednesday was a rest day and an opportunity to write a couple of posts before the state visit from Helen of Oz. Decoration of the library has come to and end (almost) and the books are slowly moving in. 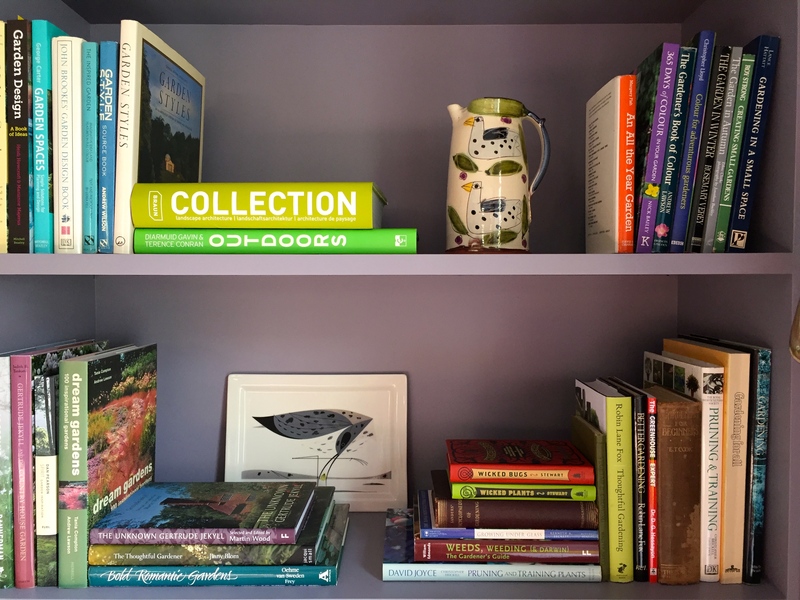 Design-conscious friends have suggested organising them by colour, but that would only mean I could never find the one I wanted, so I have put them on the shelves by subject. I find I have a lot of biographical books, most of which I haven’t read; an abundance of plant monographs and not enough books on trees, shrubs and vegetables. I’ve discovered a good few duplicates too. Thankfully there is enough space for me to keep collecting for several more years, and the shelves look better for not being packed to the gunnels. The task of getting the house back into order starts now, a full thirteen months after the project began. Everywhere I look there’s a pile of paperwork or a box of ‘useful’ detritus which needs dealing with. I am committing to myself that the library should become a sanctuary away from all of that, so only ‘cleansed’ items may be admitted. The temptation of filling eight new cupboards with junk must be resisted. 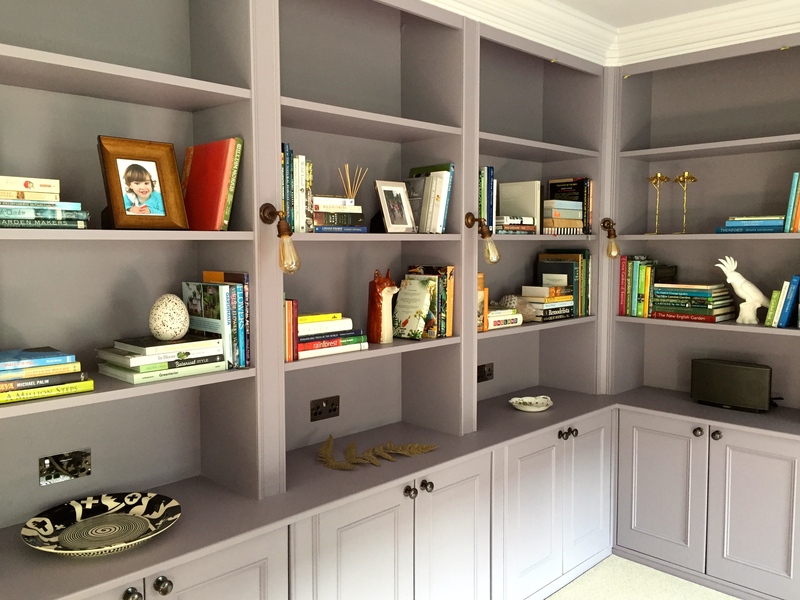 I settled on a decorative scheme of greyish-lilac with soft green and saffron highlights. 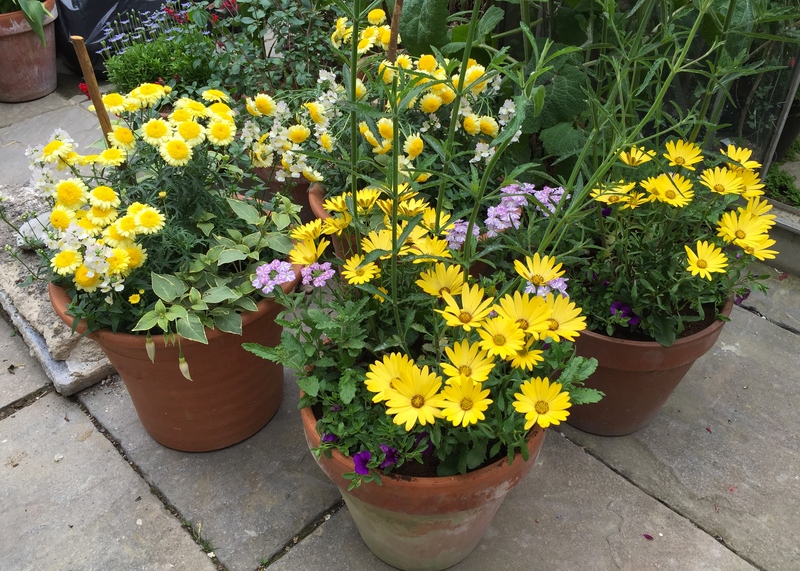 I am extending the palette out into the garden with olives, echiums, yellow marguerites, mauve verbenas, Bulbine frutescens and – I never thought I report this – clipped box balls. Box does not feature in my normal style of planting, but it looks right here – or at least it will when the decorator clears all his rubbish out of the garden. 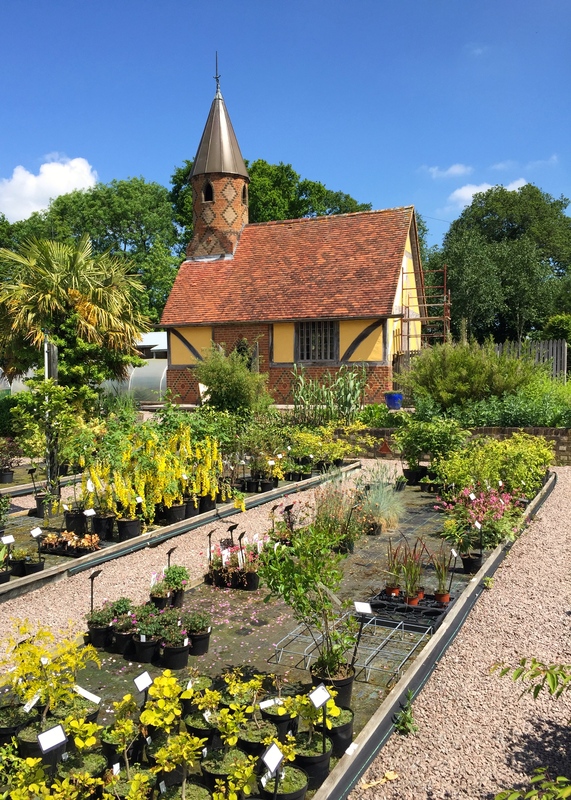 Thursday took Helen of Oz and I to Sissinghurst via Madrona Nursery near Pluckley in Kent. Madrona is one of my favourite places to buy plants because of the eclectic range. They have everything from shade lovers to drought survivors, and the quality of the stock is always excellent. The nursery’s setting, among the woods and fields of the Kentish Weald, is also dreamy. I came away with Salvia ‘Love and Wishes’, Catalpa × erubescens ‘Purpurea’, Agapanthus ‘Back in Black’ and Persicaria ‘Purple Fantasy’. Given the sublime weather, and it really was sublime, Sissinghurst was busy, but not unpleasantly so. The garden was brimming with irises and roses and looking very fine indeed. 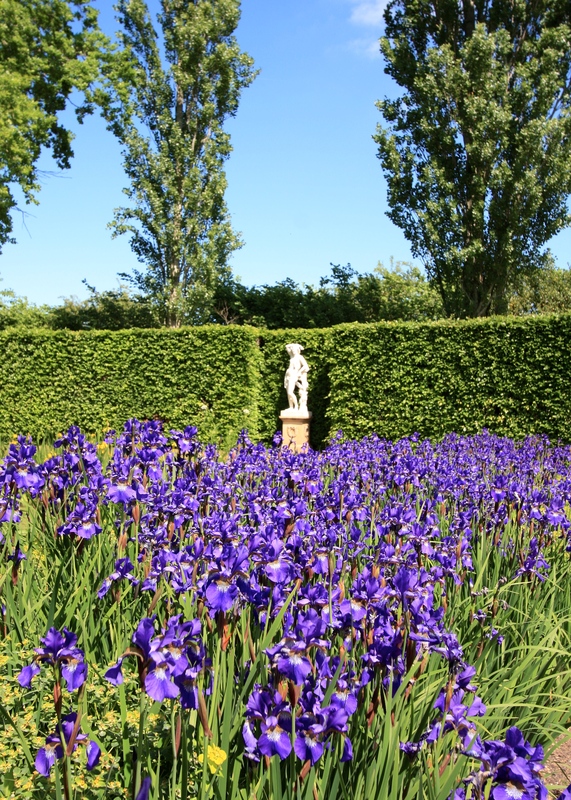 There are lots of changes going on, including the opening up of the cutting garden and replanting of the phlox garden; an extension of the Nuttery which will take it right up to the paddock fence; and a stunning planting of Iris sibirica at the end of the moat walk. The simplicity of this scheme is dazzling and refreshingly contemporary. Beyond the garden gates wild flowers are being encouraged to return to the meadows in front of the house and next to the cafe. A guided tour around the South Cottage, where Vita and Harold slept, was a special treat, providing a fascinating insight into the couple and their extraordinary relationship. 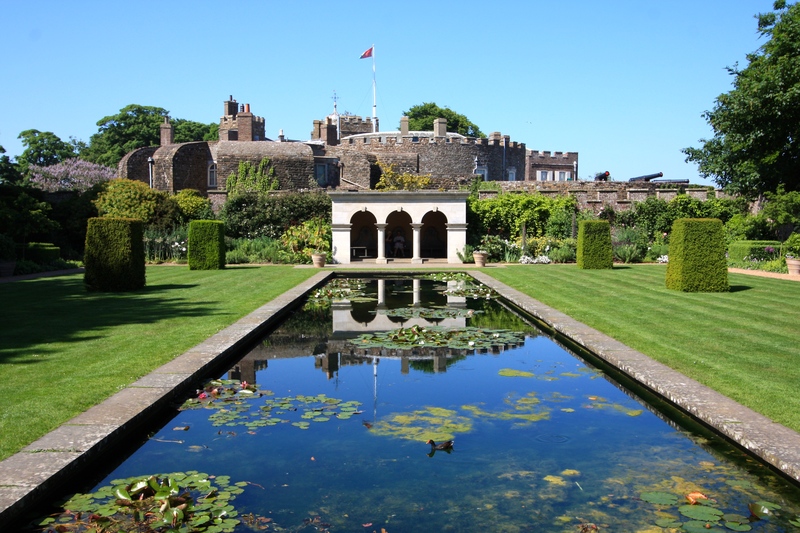 Our final stop before Helen of Oz had to return to London was Walmer Castle near Deal. 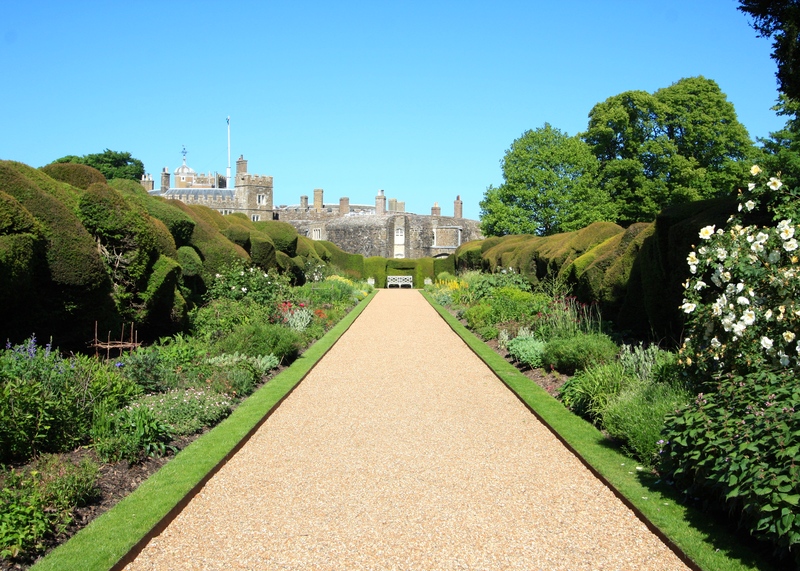 Once a home of the Queen Mother, Walmer Castle has wonderful gardens which are rarely busy. We shared a stroll around with a coach party of Danes who were equally enamoured of the kitchen and cutting gardens. The herbaceous borders, bounded by thick, undulating hedges, were already looking strong, particularly the yellow section in the middle. A preponderance of Mexican fleabane (Erigeron karvinskianus) in the walls surrounding the moat got me thinking about planting some in my own humble garden. In just a few days it will be June and, before we know it, the longest day. With Helen of Oz on her way back to Melbourne, it’s been back to sorting out the garden, watering and getting the house straight before my not so merry return to work and the imminent arrival of summer. Wishing you all a very merry May Bank Holiday Monday. TFG. How lovely described, Dan. Your photos and written words made me smile at the end of my busy Sunday. I was helping my brother-in-law harvest the honey from 6 bee hives. It was a little tiring but absolutely rewarding , as we collected a huge amount of honey ( 107 kg = 77 one-litre jars ). I like the view of your new library and the photo of Martha Moo 🙂 on the shelf. Have a nice week. Best greetings. P.
That is a phenomenal amount of honey Paul. They were busy, busy bees! And I bet it will be delicious after the bees feasted on all those lovely spring flowers. I’ll bet your brother-in-law was very glad of your help. Hope he will share a few pots with you? Ah, May! So far here in Canberra May hasn’t been too bad but that is about to change as we ready ourselves for winter. 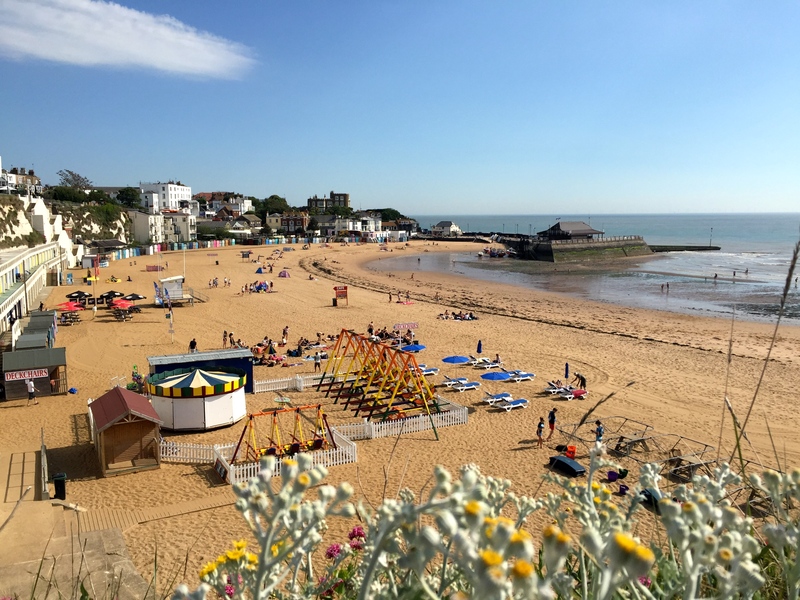 Still, I shall have your lovely photos to remind me of the promise of warmer days ahead. It was interesting that you liked Chris Beardshaw’s garden best as I was a tad disappointed in it. He is one of my favourite designers but this time I thought his garden had a sameness about it. I shall look forward to your post about it so I may see what you see. 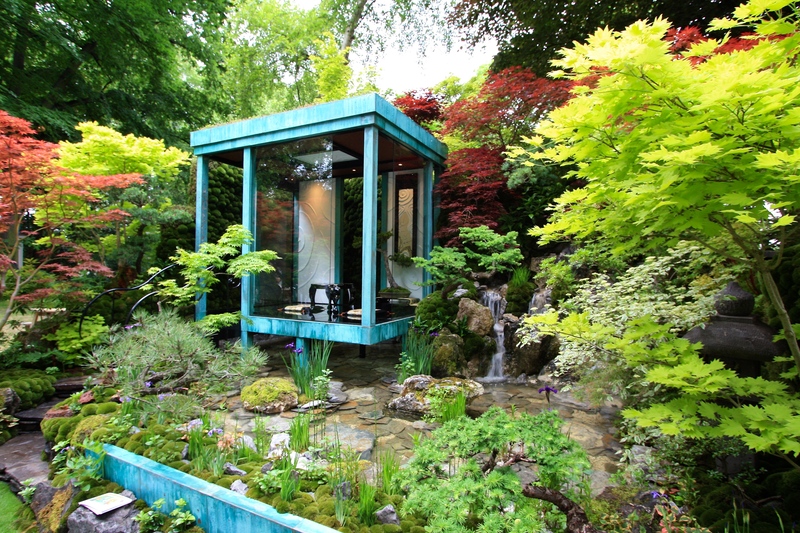 Totally agree with your comments on Kazuyuki Ishihara’s garden. Beautiful! I know what you mean about Chris Beardshaw’s garden Jenny, but it was the only one that really ‘spoke’ to us in terms of something we might enjoy in our own gardens, although I liked Sarah Raven’s cutting garden for that too. It wasn’t revolutionary at all, and the message was a bit lost on me. Glad autumn is proving pleasant. How cold does it get in Canberra during the winter time? Don’t lupins grow in Australia? Anyway, love the grey bookshelves. Great colour – and the orderliness. 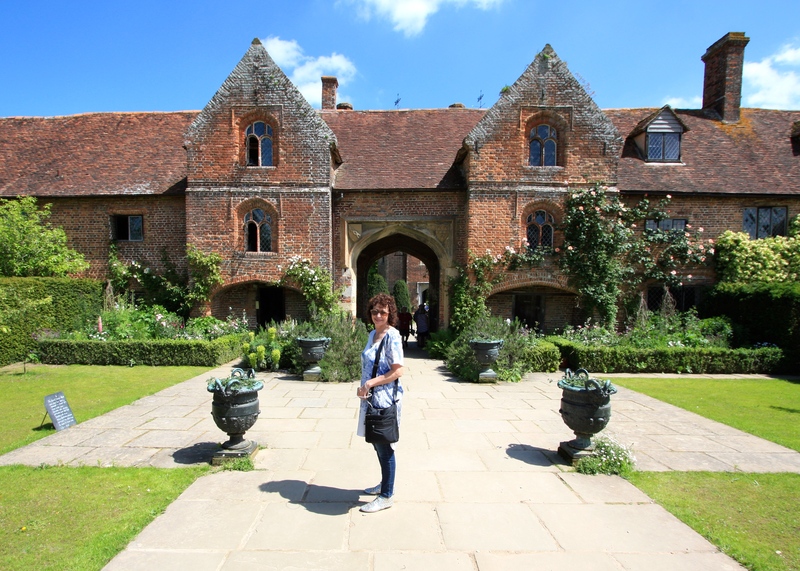 Would love to visit Sissinghurst – will look into a holiday in that area, so I can appreciate a few sights whilst there. Lupins in Oz?, but they do Helen, it all depends where, One must remember Australia is a continent with many climatic zones, from the tropics to cold Tasmanian climate similar to Scotland. Beautiful Post as usual Dan. I am sure Helen of Oz is going to be ordering seed as soon as she gets back to Melbourne Barbara. Our climates are not that dissimilar so I am sure they will take …. if the wildlife doesn’t decimate them before they have a chance! Interesting that you mention grey Helen. The colour is actually more of a stormy lilac most of the day, but in the evening (when it gets dark outside) it becomes much more grey. It’s one of those chameleon colours. If you go to Sissinghurst you can always combine with Pashley Manor and Great Dixter on the same trip. The countryside around there is beautiful. Lilac is good as well! That’s interesting Candy. We were fortunate that Tuesday was probably the coolest day of the week. I am not very good in the heat! We found shade in the Artisan gardens / huts area, beneath Tom Raffield’s lovely lighting. I still have books everywhere – gradually sorting through them and giving them a new home. It’s going to take a while! Lovely piece Dan. I used to go to Chelsea every year when younger, but don’t think I could manage the crowds, heat, and no-where to sit now that I am older and less able. I must content myself with the TV programmes, which lack quite a lot, not least the many fragrances. I still remember the overwhelming experience of walking into the Grand Pavilion for the first time, the colour and fragrance enough to cause an attack of the vapours! Love your pictures of the new house, and was reminded that it is ages since I went to either Sissinghurst or Madrona. Might manage Madrona this year, although there’s no more room in the garden. (Funny how we always say that, and then buy more.) I have managed to obtain a number of plants of Nemesia Wisley Vanilla and its clones, on your recommendation, (That is, plants that look and smell amazingly similar but have a variety of names) I have been surpised to find that not only do the Nemesia plants survive the Winter in my garden, but that some of them seem to have seeded about too. When are you opening again for NGS? Would so love to see all your changes. Ahh yes, the fragrance! Amazing. I am pleased you have found the nemesias. I too have lots this year. They are already filling out nicely. We decided to take a year off from the NGS this year as it had started to take over our summer. I expect I will start again next year. However, you are very welcome to come around any time to have a look. No need to wait until next year! Perhaps give me a nudge in early July and I can let you know when it’s looking at its best? My suggestion for going to Chelsea is to arrive at 7.40 am, in the gate at 8am and out of there by 10am. I’ve always done that as I cannot stand big crowds that move like slow rivers – makes me panic to get out – so I leave at 10. Two hours gives me time to see what I want to see in relative peace. Very wise! I also like to be there late, between 6 and 8pm, as the light can be lovely and it tends to be only the die-hards and corporate hospitality folk there at the end. Agree about the slow moving crowd. It’s not enjoyable at all. Thanks for the invitation, Dan. Would love to take you up on it, will contact you later in year. Cannot quite understand why Chris Beardshaw’s garden only awarded silver gilt. Political correctness I fear getting into the judges vocabulary. Some of those chosen for gold (in my opinion) were notable only for their lack of plants and ability to shock. For me too much emphasis on hard landscaping this year. Love your new library and took rather more than a passing fancy to the white cockatoo. Dearest TFG – am home to dreary, cold and rainy ‘English style weather’ sob sob. What a wonderful post. 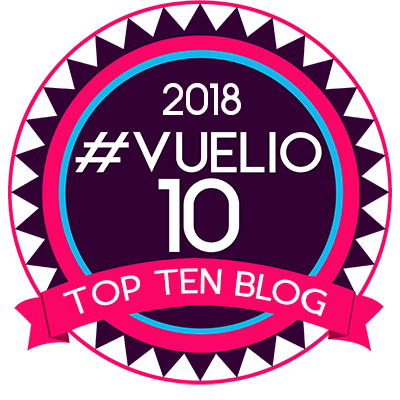 I will be sharing with all my family and friends as it is a lovely summary of some of the fun things we shared (glad you didn’t put all our wine selfies in!!!) This weekend I will be on my lupin mission. I am going to find a way to grow some of these no matter what – you have the aggie challenge, I will have the lupin challenge. Am heartened to hear a number of other followers were also disappointed with the focus on ‘hard’ lanscaping and ‘politically’ correct gardens at Chelsea. Give me flowers, veggies and greenery and above all LAWN! LAWN! Thinking about it, did any of the show gardens have a lawn? Now you mention it, that was what I missing. Do you recall this garden which I loved in 2014? 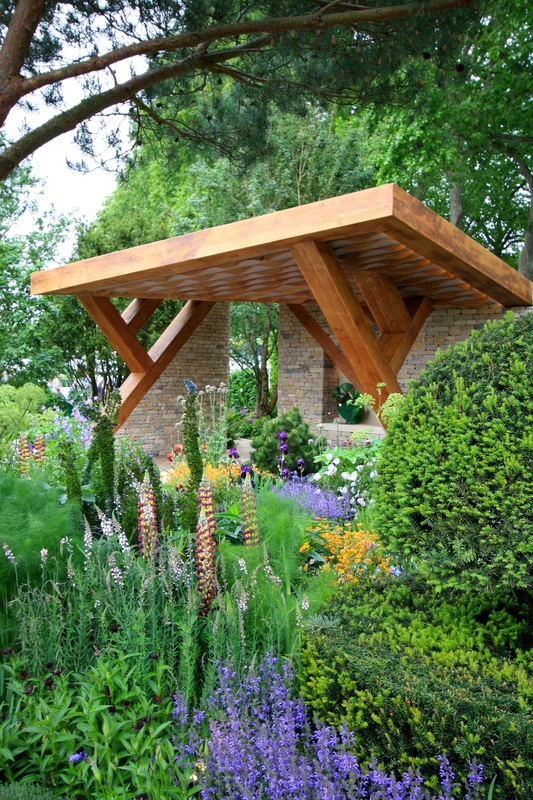 https://frustratedgardener.com/2014/05/21/chelsea-flower-show-2014-stars-of-the-show-the-telegraph-garden/? It still stands out for me as one of the best in recent years … and it has a wonderful lawn. I do hope lawns come back into fashion as I am a bit over meadows. I am sure you can rig up a plastic bucket in a gum tree? Oh, don’t worry Gill. I don’t know where this year is going myself. My post on Chris’ garden should be ready later, but alas does not include a photograph of him. He’s a very neat man, and I thought his face looked incredibly taught. I notice these things. Maybe being out in the sun all day does that, or the stress of Chelsea. I am generally in awe of anyone with a taught face these days! Well we enjoyed Chelsea this year even though show gardens were thin in the ground and of variable quality compared to other years…but always good to be on the showground and love listening to other visitors comments! I have to say your library is sublime and we are very envious of al the half filled shelves and empty cupboards!!! Fab colour scheme and hope you have reclined with a G and T by now…? I have. A Four Pillars Bloody Shiraz Gin and Tonic. An Aussie classic 🍹. Cupboards still empty. Too busy in the garden!